One person died and another one was injured when an armored infantry vehicle crashed into a shop booth. The driver was reportedly drunk. The tragic incident in the city of Perm in central Russia happened on Sunday night at approximately 2am local time. Two people were standing by a shop booth when a BMP-2 vehicle slammed into them. The 14-ton vehicle was reversing as it was making a turn, knocking both men down and crushing a wooden fence in the way, reports Komsomolskaya Pravda newspaper. One man was killed immediately in the collision, while another one suffered serious injuries and was taken to hospital. The combat vehicle was driven by an instructor from the Perm Military Institute of Interior Troops. According to the traffic police report, the sergeant was drunk. Allegedly he did not even notice running over the two men. Komsomolskaya Pravda adds that the man, along with five of his students, had a party that night, and when they had no booze left, they went in search of more in the only vehicle they had available. “We have a lot of questions to ask the Institute authorities on how a sergeant could manage get to the depot and take a vehicle unhindered,” commented military prosecutor’s office. 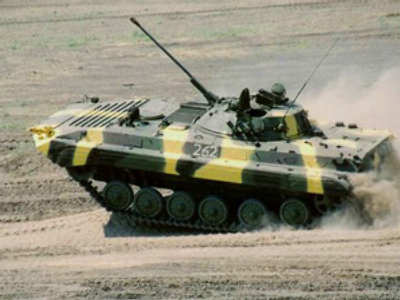 A BMP-2 is a squad level combat vehicle with a crew of three and seven passenger seats for strike team members.